Wilt Pruf Gallon concentrate 07011 by Wilt Pruf Products, Inc.
> Wilt Pruf Gallon concentrate 07011 by Wilt Pruf Products, Inc.
Wilt Pruf concentrate 1-Gallon with special shipping & handling option via Priority Mail - if you are purchasing more than one gallon you will save money with this combined shipping solution shipped via FedEx Ground/Home Delivery, makes 5-10 gallons of solution. Usually ships within 24-48 hrs. via USPS with delivery in 2-3 days for mainland U.S., may take longer for AK & HI. Enter your zip code into the Calculate Shipping box and click go. Choose the Super Saver Shipping option ($8.30). 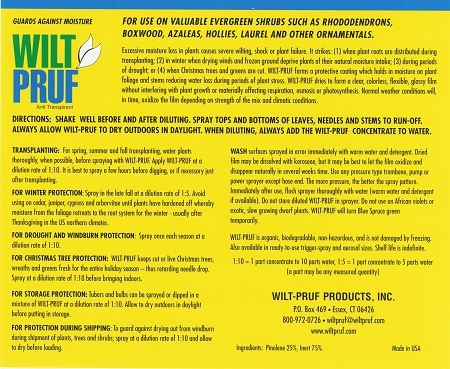 I have used Wilt Pruf for many years and have found that it does what it says it will do as long as you follow the directions. Last winter was an especially hard winters with low temperatures and icy winds. 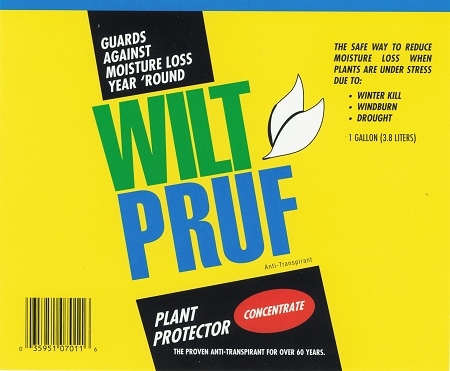 But the Wilt Pruf did what it said it would. Although my neighbors suffered damaged bushes, my bushes came through without any damage. 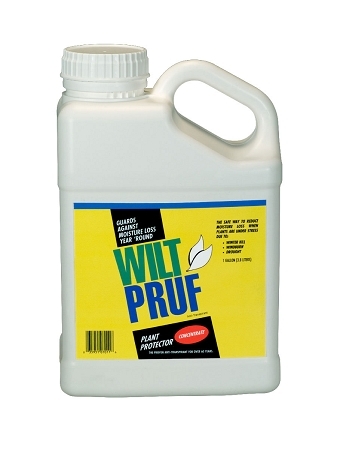 Also, I have purchased Wilt Pruf from Better Flora all these years and have been very satisfied as to price and time of delivery. Two years ago, the product arrived damaged and Better Flora replaced it, no questions asked. Another year the post office would not deliver because of an unknown liquid sound. Better Flora shipped using another carrier. Product is great and so is supplier. I first heard about Wilt Pruf about 15 years ago from a woman who ran a garden center and made wreaths during the holidays. She told me to spray my Chrismas tree and wreaths before bringing them inside. It's amazing; they look greener and last longer without losing their needles. Now I use it on all my winter greenery indoors and out. I buy it by the gallon concentrate and use a sprayer to wet down all garlands, wreaths, and pine trees. I also use it outside on Rhododendron and Hollys.